The most spectacular of Lima's colonial churches, San Francisco is a striking white and yellow building with twin towers and a stone façade. It was one of the few buildings to survive the devastation of the 1746 earthquake and is famous for its underground catacombs, which contain the bones and skulls of an estimated 70,000 people. The interior of the church has arches and columns decorated with beautiful mosaic tiles and an exquisitely carved Moorish-style wooden ceiling above the staircase leading to the cloisters. The Baroque church also contains a superb 17th-century library with thousands of antique texts and a room containing painted masterpieces by Reubens, Van Dyck, and Jordaens. Visitors have to take a guided tour to explore the church and catacombs, and tours are available in English. The remains in the catacombs are stacked in geometrical patterns in circular stone pits, and although the tour is fascinating it is not recommended for the claustrophobic. 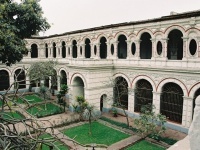 The Church of San Francisco is located just one block away from the Plaza Mayor, in the Historic Centre of Lima, which is UNESCO-listed. Swarms of pigeons congregate in front of the church, where vendors sell seeds so that tourists can feed them. Address: Corner of Lampa and Ancash Avenues.